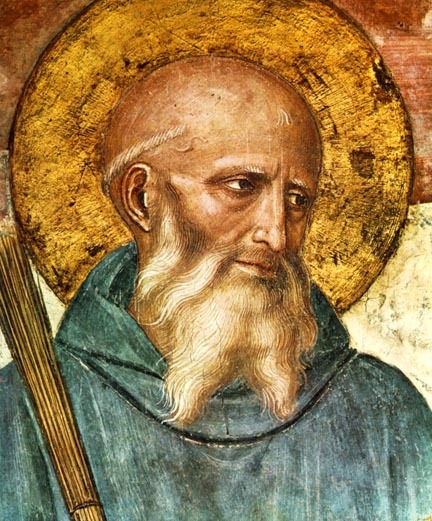 St Benedict also spent 25 years of his life in Subiaco, Italy. It is uncertain if the relics of Saint Benedict and Saint Scholastica are still at Monte Cassino or if they were moved in the seventh century to Saint-Benoît-sur-Loire, France. *The remains of St Benedict and St Scholastica are said to rest under the main altar of the church at this monastery. Following the tragic destruction of this church during World War II the relics were exhumed and analyzed. This study, conducted in 1950, did not produce conclusive evidence to either confirm or deny the authenticity of these relics. *Tradition claims that during the latter part of the 7th century relics of St Benedict and St Scholastica were stolen from Montecassino and brought to this city in France. Today this is still a hotly debated issue with both shrines claiming to have the authentic relics. The relics located here rest within the crypt of the church. *An arm bone of St Benedict rests within this church. It is placed in front of the beautiful funerary monument dedicated to St Apollonio on the right side of the nave. Around the year 759 this relic was given to a Benedictine community in Leno, located just south of Brescia. During the 15th century it was transferred to Brescia. *Recently this bone has been rigorously studied in an attempt to authenticate the relics in either Monte Cassino or Saint-Benoît-sur-Loire. Documentation shows that this bone came from Montecassino in 759. This late date provides evidence that at least some relics of the saint were still preserved in Montecassino following the alleged theft in the 7th century. On the other hand, recent studies seem to indicate that the physical characteristics of this bone from Brescia do not match the Montecassino source. *Subiaco is where St Benedict lived as a hermit. It is also from this city that he began establishing monasteries. In total he spent 25 years of his life in this city. *This church is located in Trastevere near the Ponte Sisto Bridge. *Tradition claims that St Benedict stayed at the location of this church during a visit to Rome. *This church is south of the Aurelian Walls. *In the right transept is a small chapel dedicated to St Benedict. *St Paul is buried in the confessio. Above his tomb are the chains that were used to imprison him prior to his martyrdom. These chains were moved to this prominent location in 2008. *This church is just south of the Pantheon. Its postal address is on Vicolo Sinibaldi; however, its front door is just around the corner on Via Torre Argentina. *The church is very small and it is set into the surrounding buildings. It is dedicated to both St Benedict and St Scholastica. It is not open often.